Thanksgiving and turkey go hand-in-hand, except for the People for the Ethical Treatment of Animals. PETA is going vegan for the holiday (well, PETA is always vegan, but that includes Thanksgiving), and the group wants you to try it, too. And PETA is making it as easy (and cheap) and possible for you, giving away the meatless alternative to the traditional dish: Tofurky Roast. For those unfamiliar with vegan-speak, that's a tofu version of turkey. PETA members have been known to spread their message by barely dressing in anything at all, but for this event, two of the group's members will be dressed as turkeys. "Animals on factory farms never get a holiday," said PETA senior campaigner Ashley Byrne. 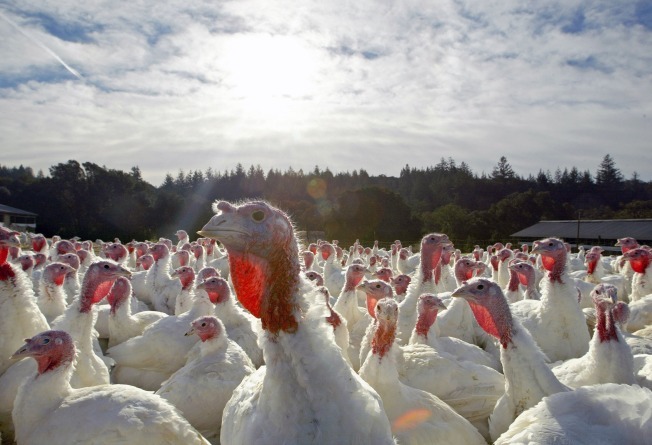 "The 40 million turkey carcasses that U.S. shoppers buy each Thanksgiving represent only misery." The giveaway will be hard to miss. A couple of oversized turkeys standing upright, right there on Fourth and Market streets, starting at noon Tuesday in downtown San Francisco. They'll be handing out Tofurky Roasts, along with copies of the "Vegetarian Starter Kit." They'll be doing the same thing in San Jose Wednesday at Cesar Chavez Park at the intersection of Market and San Carlos. And for the day after Thanksgiving? How about that leftover Tofurky loaf simmering in a nice soup, or a couple slices of Tofurky and dressing inside a couple slices of bread.